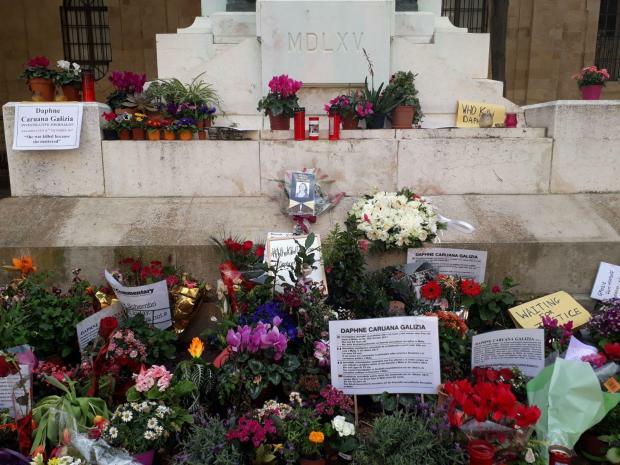 The foot of the monument has served as a shrine to Ms Caruana Galizia for almost a year. Photo: Chris Sant Fournier. Scaffolding and hoarding has been controversially erected around the Great Siege monument, which has served as a memorial to slain journalist Daphne Caruana Galizia for almost a year. 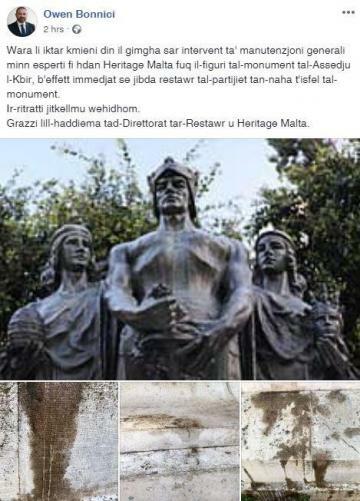 The lower part of the historic monument will be undergoing restoration, Culture Minister Owen Bonnici explained in a Facebook post later. The minister reproduced images of the lower part of the Antonio Sciortino monument and wrote: "the pictures speak for themselves". 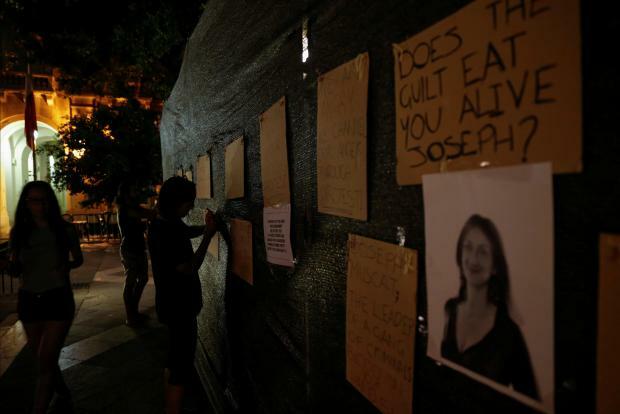 Activist group Reżistenza Malta were sceptical of that explanation, calling the hoarding "cowardly" and accusing the government of trying to wipe Ms Caruana Galizia "out of our nation's collective memory". The group put up a banner on the hoarding featuring Ms Caruana Galizia with the words "She investigated them, they killed her". Smaller posters with defiant anti-government messages were put up alongside it. 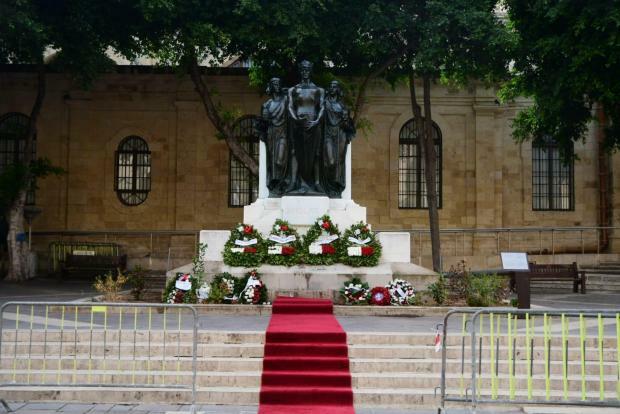 Controversy over the Valletta monument was reignited on Sautrday morning when authorities removed all traces of a memorial to Ms Caruana Galizia at the site ahead of an official ceremony which saw the President lay a wreath at its foot to mark Victory Day. 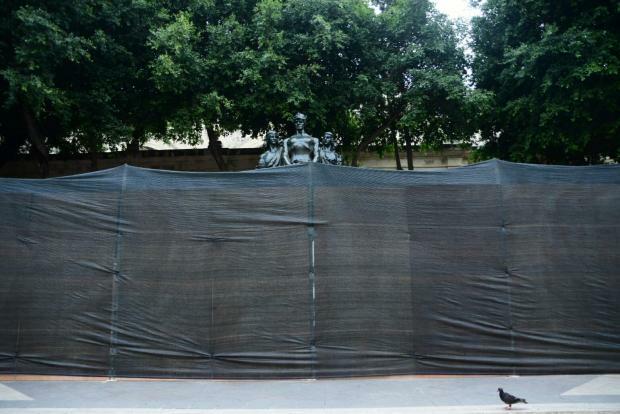 Steel barricades and a red carpet were set up at the site opposite the law courts. 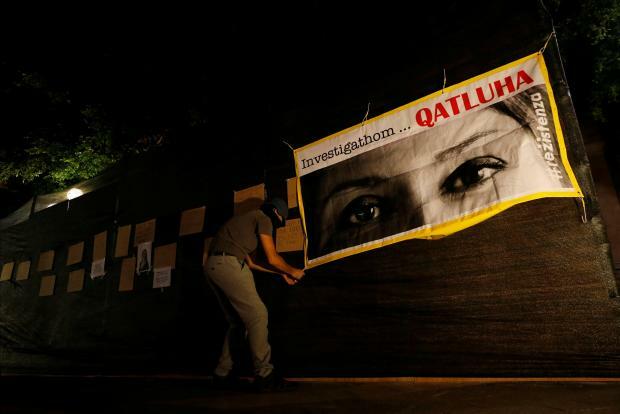 The monument has been used as an makeshift memorial site for the murdered journalist by activists and supporters over the past months, despite the staunch – and vocal – opposition of government officials. It had most recently cleared on Wednesday night, as authorities worked to ensure the official monument was clear for a wreath-laying ceremony to be held on Thursday evening. Hours after the ceremony was over, activists from pressure group Occupy Justice had restored candles and a portrait of Ms Caruana Galizia at the site. But the tributes were short lived as access to the monument was blocked. Among those who protested against the latest move were former Nationalist Party leader Simon Busuttil and the victim's son Matthew Caruana Galizia. Din L-Art Ħelwa president Maria Grazia Cassar told Times of Malta she found it odd that the monument was being covered with hoarding as Valletta was marking its last leg as the European Capital of Culture. "Our own organisation had to abide by the rules and had removed scaffolding in connection with the restoration of Our Lady of Victories church in Valletta last December... Any works on the Great Siege monument could easily have been postponed until the end of the year," she said. She also recalled that the monument was last restored by Din l-Art Ħelwa in 2010. Activists say they will continue to use the spot to honour Ms Caruana Galizia's memory until justice has been served and the people who masterminded her murder brought to account. Victory Day commemorates Malta’s survival of the 1565 Great Siege, French blockade of 1800 and bombing by Axis powers during World War II. 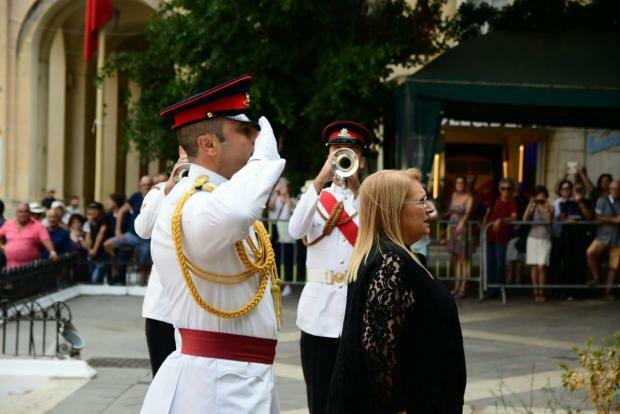 President Marie-Louise Coleiro Preca laid a wreath at the monument to mark the occasion at 10am.